ITEM P339 - Poole Bluebird Pattern Vase PB Designed by Truda Adams. Shape 271 Decorated by Marjorie Batt. Poole pottery blue-bird pattern earthenware vase designed by Truda Adams. 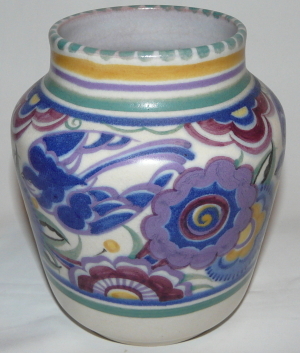 This vase is decorated by Marjorie Batt with pattern PB. The vase is shape number 271 and is approximately 5½" high and 5" in diameter at its widest point. 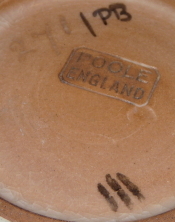 On the base it has the Poole England pottery mark, the pattern code PB, shape number 271 and decorator mark of Marjorie Batt. 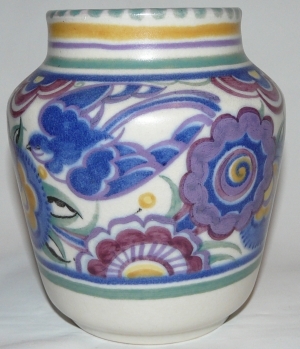 This vase dates c1925 to 1934. Condition: Excellent overall condition with only very light crazing. 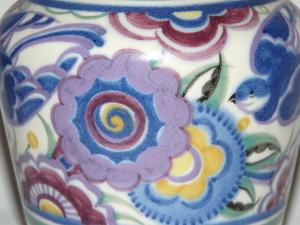 A superb bluebird pattern vase.